I am the first to admit, I love me some original scented Tide. I love the way it smells. What I don’t love is the price I pay, especially for the high efficiency safe stuff. So awhile ago, I began making my own laundry soap from the above pictured ingredients. I found everything at my local Hy-Vee grocery store and it costs me $2.80 to make 10 gallons. Please, don’t let this weird, coagulated gloop keep you from giving this stuff a try. It may look weird and have a consistency you have never before witnessed, but it works like a charm and will save you a boatload of money. I really like the scent it has naturally but feel free to add your favorite essential oils to customize it! Yes, it is safe for HE machines because it is low-sudsing, which is the only “secret” to HE detergent. I have a HE machine myself and love my results. In a medium saucepan over medium-low heat, melt together the grated soap and water until the soap is completely dissolved. Fill a 5 gallon bucket 1/2 full of hot water. Add the washing soda, Borax and melted soap mixture. Stir well until dissolved (I used a yard stick). Fill your soap dispenser (I use my old Tide container) 1/2 with water and half with soap. Shake well before each use. For front load washers, use 1/4 C – 1/3 C per load. For top load washers, use 1/2-5/8 C per load. I love your recipes! The shout was a little bit thick and wouldnt spary even out of the shout bottle, added a little water and works great! I am really impressed, had no idea it could be made so simply. How long can you keep a 5 gallon bucket of the laundry soap? My 5 gallons last me about 9 months before I run out, so at least that long! I have been looking for a recipe for laundry soap, but every one I find calls for that weird soap and washing soda. They are both unavailable to me, I live in a very rural area. So I wondered if you may suggest any substitutes for these 2 things. I am however able to get Borax. You can make your own washing soda from baking soda. Place a couple of cups of baking soda on a raised edge cookie sheet spread evenly and bake in a 400 degree oven for about a half hour. Stirring to mix it up about half way through. Stir slow as it get very powdery as it heats. Take it out and let cool and store this in an air tight container. Oh and no I’m not a genius or a mad scientist. 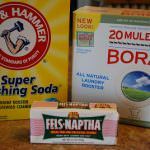 You can find the Fels-Naptha and the 20 Mule Team Borax in any store that sells laundry soap. If they don’t have it they can get it for you. This is really good soap. I have used it for about 6 years and would not use commercial soap ever again. Anonymous: I also live in a small town, so I feel your pain. I know some people have used regular bar soap instead of Fels Naptha, but I wouldn’t think it would work as well since Fels Naptha is concentrated and specifically made for clothing. Both the Fels Naptha and the washing soda are available on Amazon, so don’t give up yet! It is worth it! Hello, I just joined pinterest and seen your recipe for soap. Sounds super easy and i wanna try it but I wanted to know if there was anything else besides oils that I could add to get a fresh amazing scent??? My husband is for sure all about the smell of his clothes after he sweats all day doing construction. Any ideas would be great!..Thanx for sharing! I, too, LOVE great smelling laundry, (I am a Gain fanatic) so I started adding a large bottle of the Gain scented Unstoppable fragrance pellets to mine homemade batches. I add it to the pot right along with the grated soap. It melts like a charm, makes the whole house smell like Gain, and makes my clothes smell great! I LOVE it! Oh oh oh! I also love the smell of Gain (Original) and love the smell and miss it with this recipe. Will try this and am so glad I stumbled over your post! Be sure and come back to let me know what you think Karen! Just stumbled upon your site thanks to Pinterest. I’ve seen this laundry soap recipe before, but the Shout recipe was a new one and I’m looking forward to trying it out. In response to the earlier post from Anonymous, I too live in a pretty rural area. But I did notice that our local Wal-Mart now carries all three ingredients needed to make this soap – it was all right there in the laundry aisle. Maybe your Wal-Mart has them too? Quick tip regarding the consistency of the soap. Get a 5 gallon paint/compound mixer they cost five bucks and attaches to any drill. Put it in the drill and the slowly start blending the soap for about three minutes. It will be more creamy and easier to scoop. LIssa- thanks for the wonderful tip! I will definitely get that attachment for my drill. As I’m working on laundry from the flu here I am grateful for your recipe! Thanks for giving it to my mom so we could have some! Hope you feel better soon Brittany! This recipe is a huge money saver for my large family! I cannot wait to try your soap! One question though, to use a 1/2 or 5/8 of a cup for a top loader couldnt you just not dilute it by half when you transfer to a regular bottle and use 1/4 of a cup? Becky- you could try doing that, but it is a very thick, gelatinous mixture so I’m not sure how well it would distribute without diluting it with water first. If you try it, let me know how it works! For the people that can’t find the Washing Soda and the Fels Naptha- I found it at my Ace Hardware store! I’m pretty sure there are Ace or Westlake Ace Hardware stores all over the country. By the way, can’t wait to make your fabric softner!!! I have made this recipe too, only the dry version, and I used a bar of Kirk’s Castile Soap. It smells wonderful, very clean & fresh, and it’s completely natural too. It’s working well, so I don’t know if the Fels Naptha recipe works better, but I will try that one in my next batch. I am wondering if anybody has compared results with the liquid laundry soap vs. the dry. Is either one more effective than the other? I have seen the dry homemade laundry soap recipe as well. I have never used it, but when I used store bought soap, I always preferred the liquid. That is why I chose the liquid for my homemade version as well. I will definitely be looking into Tide essential oils!! Thanks! Here you go Carole, a link to the tide scented oil 🙂 http://www.sweetcakes.com/product_info.php?cPath=8&products_id=184 Thanks a bunch for the recipe too. I can’t wait to try all of the laundry ones you posted!!! I am interested in making your laundry detergent and I’m a big fan of essential oils but I’m not sure if I would want to add that to the detergent or not. If I did, how much essential oils do you add to one batch? I saw the link to the tide essential oils, but what other essential oils have you put in your laundry detergent? If adding essential oils, I would add them as I mixed up each batch with the water. I wouldn’t add them when I made the 5 gallons or it might lose some of it’s potency. The amount is completely up to you. I add about 1/4 tsp to about a gallon, but you could always go more or less depending on what you like. Have you noticed a lot of fading or fuzzies on your clothes from the soap? I’ve noticed that sometimes if I buy some of the cheaper detergents they seem to age my clothes a lot quicker. So excited that they make Tide essential oil! aA – You do need to cover it. Hope you love it as much as I do! Carol, my daughter & I just made the laundry soap last night (we’re sharing a batch) & were both eager to try it. When we were cleaning up our funnel (we’re storing the concentrate in milk containers) I noticed how minimal the suds are & wonder if this could be used in a dishwasher. Any thoughts to this? We love the clean smell of this soap and can’t believe we’ve been wasting so much with purchased laundry soap. THANKS for your recipe! FYI, I’ve used a similar recipe with OTHER bar soap and it did NOT turn out as well, didn’t wash as clean. I recently made this one and it washes BEAUTIFULLY! Unknown – I have never thought to use it in the dishwasher. I wonder how well it would do on greasy stuff? If you try it, let me know! Ronsgal – Glad to have you here and that the soap is a success for you as well! Hello! I just made the soap last nigh. Got up this morning and yuck it was a constancy I have never seen! I do have one question. I mixed it with half water and shook it well but it still had some small clumps in it. Is that ok? I started a load so I guess I will see but just thought maybe I should ask. It smells great and I am excited to get it going! Clan6 – Yes, the consistency is quite off-putting! I wouldn’t worry about a few small clumps, but be sure you mix up the concentrate well before mixing it with the water. I also leave a bit of room at the top of my dispensing container so I can shake it well before using it. I can’t wait to try this! I am all about reusing right now with the economy (living right next to DC doesn’t help!) and I was wondering about using a pump-style detergent holder. I have one that uses 4 pumps per load, I’m not sure if that would clog the pump. Thoughts? Katie: As long as you mix it up really well, it should be just fine. Also, be sure you shake your container each time before using. I have made laundry soap a few times. The recipe I have used does not use Borax. What does this do? Also, the one I have made says to just use a cup of the soap right out of the bucket (Don’t mix with water). I have tried the Fels Naptha, Ivory, and I just made some with the Kirks Castle soap. They all seem to work well. The last one with Kirks didn’t gel up like the others though. Lisa – I would hesitate using this undiluted because it is quite thick, but if you do try it, be sure to use half as much. Susan – Did you use the recipe straight from the bucket or did you mix it one part water to one part detergent? I have an HE machine and it isn’t a problem. In fact, the end result should be really liquidy compared to store bought stuff. Love this soap. I’m wondering if you or anyone bought the tide fragrance oil and if so how much did you use and how did it turn out??? I also found a shop on etsy that sells the tide fragrance. The other websites either have a minimum purchase and high shipping rates or didn’t work. Anonymous: I am not familiar with Sunlight bar soap, so I really can’t give you an honest answer. If you can’t find Fels Naptha in the laundry section of your store, Amazon has it as well. I made this yesturday. But after the 24 hours, it wasn’t gel. It was watery. HELP…… what did I do wrong? Do u have a recipe for fabric softener also?? Made my first batch tonight of the detergent and am so excited to put it to use for our family of six!! Stacie; yep. I do have a recipe for fabric softener and homemade shout. Look under the “non-food” label on the right hand side of my home page. They will all be under there. Thanks! Is the 4 cups of hot water just the amount you use to melt the soap? You then say to fill the bucket halfway with hot water and then even more after you add the soap so I’mm assuming you end up using a lot more water by the end (around 5 gallons or so :-D). Is that right? Yes. The four cups is only to melt the soap in on the stove. You will fill your bucket halfway with water, add the other ingredients and then fill the bucket the rest of the way. Also, the result is a concentrated soap so you will mix 1 part soap to 1 part water before using it. Ijusts made this and it seems the thick goop is at the bottom, do I stir it or just leave it a lot before I put it into my laundry container? If you read the directions, you will see that you need to thoroughly mix once again after it sits overnight. This will be sure the ingredients are well mixed before you add the additional water when using. Thank you! I read the directions a couple times and after it says sit over night it doesn’t say mix again. So I wasn’t sure :), but I actually stuck my arm in it and although the bottom had a lot of the goop the entire bucket was definitely the consistency you had said it would. I did half the detergent and half water into a empty tide container and used it, it seems very watery. Is that normal or should it have a thick consistency? The end result will be quite thin so no worries!! I dont guess it hurts you to smell the fels naptha soap as it heats up? Nothing harsh? Hi there! I was wondering if Sunlight pure bar soap can be used in place of the Fels Naptha…? LOVE your recipes! While crusing your site I came across your recipe for “Homemade Laundry Detergent” and felt compelled to post my comment. As the wife of an Appliance Repair man, I need to let you know that the repairs for machines using this type of recipe for soap has increased 10x since the recipe went viral. Here’s the problem…Fels Naptha AND Zote have a base of Tarrow, which is derived from Animal fat/hooves. It is gelatin based and this apparently creates HAVOC with your Washers, innards! This goopy stuff becomes caked on the pipes and tubes ect. The last repair he did for a “Homemade Laundry Soap” household ended up costing more than the Washer was worth, so the homeowner ended up having to replace the Washer. Please know that this doesn’t happen overnight,but the more you use, the quicker the build up. Thank you so much for giving me the opportunity to post this information. Appreciate it! Carole: I just made this yesterday and was surprised at how much fragrance was in the Fels Naptha. I have chemical sensitivity to fragrances so I may or may not be able to use this (won’t go to waste though, I’ll give to my daughter). I was wondering if you were aware of any fragrance free soaps that may work. I know Dr Bronner’s makes a bar soap that may work and I buy some from Trader Joe’s and Whole Foods but all of these are for bathing. What do you think? Pammy-I think another fragrance free laundry bar soap would work well. I know people have substituted other laundry bar soaps. Let me know how it works! How do you grate the bar? I have a really hard time grating it, it sticks to everything! Stephani – I just use a box grater like for grating cheese. It certainly takes some muscle and time since the fels naptha is hard. Does the grater and the pot used for melting the soap leave a residual? Or, can you just wash and continue to use for food prep? Great question! The Fels Naptha was right off so no special ones required. I rinse them off well and then just stick them in the dishwasher. ON NUMBER 4. IS THIS THE SOAP DISPENSER ON YOUR WASHING MACHINE ? Not the dispenser in your machine. Good question! Just some container that you can mix half soap and half water, mix well and dispense into your machine. I use old Tide bottles that I fill up half with water, half with soap. I made this up last night, left the bucket covered to sit overnight. Today I have a bucket with a very firm 1inch cake ontop and very watery conditions below. No goopy gloop at all. I used a handmade bar of soap that had been given to me a few years ago. It’s ingredients were very basic and it was labelled soap. Am thinking I may need to whizz the firm cake in the food processor just to break it up again. Or maybe even start again with new ingredients? Emma- I think your problem is due to the homemade soap instead of Fels Naptha. I would try again sticking with the instructions. Good luck! Hi! I was wondering if it is possible to use the concentrated formula instead of diluting it the second time in the smaller container and just using half as much in the washing machine? I have a top loader and was thinking I could just make sure it got diluted in the machine a bit before I put the laundry in the machine. What do you think? Cindy- my main concern with that is the thickness of the concentrated detergent. I don’t think that gelatinous mixture would be good for your machine unless it was first thinned. Just my thoughts. I don’t use water when I make this detergent – one cup of each, mix it together, stick it in a zip lock bag. I use one T for each load in my front loader HE washer. Works great. MUCH easier than all that boiling and water and NO five gallon bucket!! Could I cut recipe in half? I’ve tried adding essential oils to it for scent, but it never held up to the rinse cycle. I’m going to have to try your recipe for the fabric softener! for those who cannot find Fels Naptha……castile soap is a good substitute. Most stores, drug stores, and even places like Cracker Barrel will carry Castile soap. Use the Kirk’s Castile bar soap not the liquid. Anyone have trouble with the soap starting to eat through the bucket? My bucket is leaking. I have a question about the laundry detergent: My husband has sensitive skin, so we use the Tide free and clear; do you know how people with sensitivities react to this? Carole, I have been making this detergent for about a year now. I always dissolve my washing soda and borax in the water while I’m melting my fels naptha. I really like the soap, but if I shouldn’t do this please let me know. You can now order all the ingredients need on Amazon in one set! Where is the recipe for Shout? Id like to try it also. This may seem like a dumb question but here it goes anyway. The recipe says it yields 10 gallons but I only read where you need only one 5 gallon bucket? Am I missing something? Hey Jennifer! It isn’t a dumb question at all. So the recipe creates a concentrated 5 gallon bucket of detergent, then if you read the directions, you see that you mix at a 1:1 ratio the concentrate with water, which will yield 10 gallons.